President Maithripala Sirisena, Prime Minister Ranil Wickremesinghe and the ministers have expressed disappointment over the slow progress of the investigations and the action taken against suspects by the FCID, Cabinet spokesman and Minister, Rajitha Senaratne said yesterday. He said the Cabinet had called for a report on the FCID and would decide on its fate next week. The minister told reporters at the weekly cabinet news briefing that the President while expressing his disapproval on the FCID activities had said if the FCID was brought under his purview, he would within six months expose all major cases of fraud, corruption and killings which had taken place during the Rajapaksa regime and prosecute the culprits. “The Cabinet discussed the FCID’s poor performance as only a few sprats had been brought before the law by investigative division which was appointed with the specific objective of nabbing all criminals whether big or small who were very powerful under the Rajapaksa regime. Even the Prime Minister while maintaining that the FCID was not his creation told ministers that he also was not satisfied with the work being carried out by the FCID,” he said. The minister said the FCID had failed miserably to nab big-time criminals who had engaged in major financial crimes, killing and embezzlement when the Rajapaksas were in power. He said the government spends Rs.1.2 million monthly to maintain the FCID. Much publicized investigations had been carried out against Minister A.H.M. Fowzi using a car belonging to another ministry and appointment given to his daughter by former state minister Priyankara Jayaratne. Kaata gahana bilada? CB Bond scam ekata mokada uney??? Yes, people are eagerly waiting untill government fulfill promises presented to public when coming to power. This is an essential aspect of good governance. How can the FCID act when even the Prime Minister turns a blind eye to the rampant corruption that is going on, including the CB robbery? If the government is not happy what is the next option have to take without complaining .By the way central bank bond scam in not in the list. 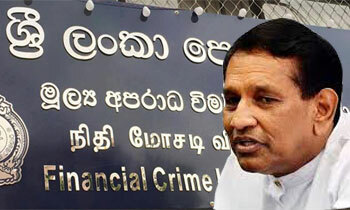 Where are the ALLEGED billions of dollars plundered by the Rajapaksha family? One of your 'Yahapalanya' promises were to get that money back and pay-off some of our foreign debt! It's taken so long to realize the fact that the FCID going at a slow pace on investigations of the said cases...It's not true.Even an average layman felt the FCID's fear of investigating. A strategy to make the people drag back to the pre-election period and score to the coming election.Politics is always a gimmick. Well said sir. Govt.keep establishing institutions and appoint committees to solve burning problems and then the heads sleep on it thinking that it was good governance. This is called high inefficiency and incapability. A leader must always follow the work done at intervals and not blame at the end saying that he could have done the job in 6 months. Why u telling us boss.... Presidents words are coming true, there is no government at the moment!!! If at this stage the President comments about his personal interference to clean up the FCID in six months, does it mean that the baby was handled with incompetence all this while and by whom ? The President must be surely aware of 'enemies' within and outside the Government. Better late than never, so the saying does. Who disarmed the FCID in the first place. The top official who did honest investigations are been removed by political agenda. Now the minister blaming FCID. It's like "defeater a bird and complaining of its flight"